Sequential counters are state machines with no inputs other than the preset inputs that initialize the system. The general block diagram for this system is shown in figure below. 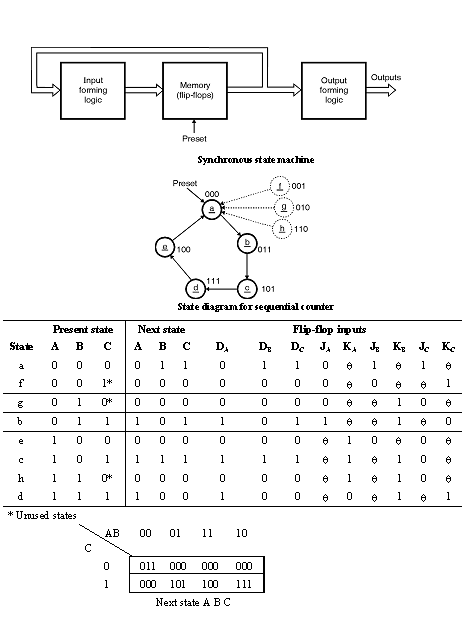 This particular type of state machine has a next state that is determined by the present state only. In order to avoid this problem, all unused states can be designed to have a next state of 000 or some other state contain in the desired sequence. If one of these states is inadvertently entered, the system will recover to the desired sequence when the next clock pulse is applied. This type of system is also referred to as a â€œself-startingâ€ circuit.